Jim Elledge has written a fascinating account of the various queer subcultures that existed in Chicago from its incorporation in 1837 through the World War II era. The book is arranged topically rather than chronologically. One chapter is about the queer journalist and diarist, John Wing, who arrived in Chicago in shortly after the close of the Civil War, at a time when Chicago was still a mostly-male frontier city—precisely the type of city in which a queer subculture thrives. Another chapter treats Eugen Sandow, a pioneering body-builder who began his show business career with his male lover, and who brought frank homoeroticism to his stage performances. Several chapters discuss female impersonation, either as it manifested on stage, or in the lives of people born male who chose to live life as female (today they would be classified as transgender, but that term did not exist during most of the period about which Elledge writes). One particularly fascinating story is that of someone who was born and died as Fred Thompson, but who lived much of life in an ever-shifting collection of male and female identities. Thompson was accused—and acquitted—on a murder charge while living life as the female Frances Carrick, and was revealed during the trial to have been simultaneously married to both a man and a woman. A novelist could not plausibly create such a character. Elledge, fortunately, has history on his side. 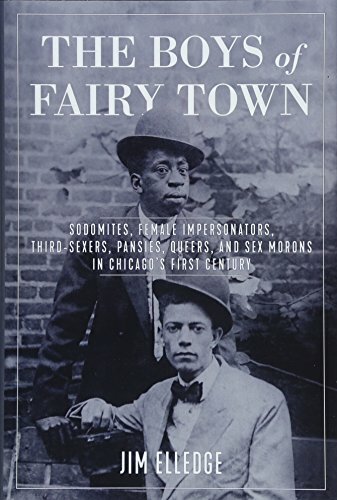 Other chapters are less focused on individual characters than they are on issues such as patterns of cruising and prostitution, homosexual activity among hobos, the periodic attempts of Chicago officials to clean up the city, and the various bars, clubs, and social institutions that provided meeting places for Chicago’s queer population. Some of these subjects demonstrate patterns of history and sociology common to other major cities with large queer populations. At other times, the unique mark of Chicago is unmistakable. This is a very good book that could have been better. Though Elledge’s research and knowledge are obviously vast, the book was apparently printed with a general reader rather than a scholarly one in mind. Although there are endnotes, there are no markings within the text (other than quotation marks) to serve as guides, so a reader wanting to track down the source of a quotation must turn to the back of the book and read each of the notes, one at a time, until finding a match. Certainly, a superscripted number within the text would have simplified this process without discomfiting those uninterested in further research. More seriously, however, is the fact that endnotes appear only when Elledge quotes source material. Fortunately, he does this liberally, but sometimes a topic is treated without a quotation. So, for example, someone wanting to know more about Horatio Alger’s sexual involvement with young boys, or about the practice of confining queer men and women to mental institutions, or about the wide variety of devices designed to prevent a young man from masturbating, are simply out of luck. There is no doubt that Elledge had sources—and good ones—for topics like these, but the lack of documentation limits the book’s utility to students and scholars. Nevertheless, The Boys of Fairy Town is an informative, entertaining, and often eye-opening book that examines the complexity of male queer culture in one of the nation’s most fascinating cities. Clayton Delery is a writer specializing in LGBTQ history. His most recent book is, Out for Queer Blood: The Murder of Fernando Rios, and the Failure of New Orleans Justice, a finalist for a Lambda Literary Award for LGBTQ Nonfiction.